For financial investors, finding the right balance between risk and reward can be a challenge. We have all heard the common proverbs that are used throughout the financial industry — don’t place all of your eggs in one basket, never bet all your money on one roll of the die, don’t count your chickens before they hatch — whatever saying is used, they all come down to the same thing: reducing heartbreak, frustration, and financial distress by finding the perfect balance between risk and reward. Investors do this through asset allocation, which aims to balance risk and reward by apportioning an individual’s portfolio assets according to goals, investment horizon, and risk tolerance. It is important for investors to build a balanced portfolio that contains a diversified mix of assets. Diversification can help mitigate the volatility and risk in a portfolio, potentially reducing the number of nerve-wracking market fluctuation influences. In order to create smooth returns over the short and long term, investors need fluctuations. Without them, a portfolio will be more likely to be affected by various market climates and may swing widely and create risk, even when the overall market seems calm. AlphaDroid Tip: Diversification does not only entail increasing the number of investments an investor holds. For example, if stock in the gas and oil industry fall due to macroeconomic factors; if an investor has all of their investments focused on this industry sector they will likely be facing financial distress. However, investors can increase the exposure of risk without adding diversification to their holdings by investing in addition stocks or Exchange Traded Funds to a portfolio. Asset classes: Stocks, cash, bonds. Industries: Healthcare, energy, manufacturing, consumer goods. The asset allocation models set by investors will change over time. Some investments will grow and create profits, while others will shrink and result in losses. It’s not uncommon for investment position sizes to fluctuate over time, which is why rebalancing a portfolio can be helpful. Investors utilize portfolio rebalancing to restore a portfolio back to its original asset allocation mix by purchasing and selling certain investments. While the concept of portfolio rebalancing may seem simple, it often can be complicated in practice. Most investment portfolios deal with multiple portfolios, such as 401(k)s, IRAs, bonds, stocks, and brokerage accounts. These are the portfolios that have been set up at different times during an investor’s life. Of course, using an investment portfolio management software speeds up the process and makes it easy to review an entire overlook of an investor’s investments. However, portfolio rebalancing can be done by using certain strategies. 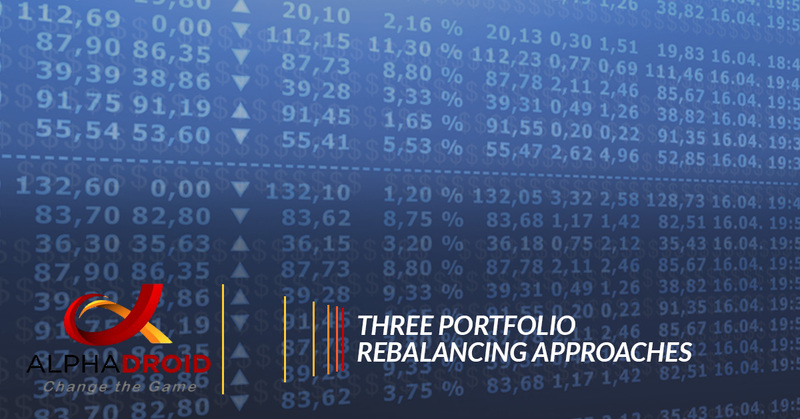 Check out three common approaches to portfolio rebalancing. Calendar rebalancing is one of the most primitive rebalancing approaches. This approach simply involves analyzing a portfolio’s investment holdings at predetermined time intervals, in addition to adjusting back to the original allocation mix at the desired frequency. In this approach, both monthly and quarterly assessments are typically preferred. Weekly rebalancing would end up costing investors too much and a yearly approach would allow too much time for the portfolio to shift. The ideal frequency of rebalancing a portfolio must be determined based on transaction costs, time constraints, and allowable fluctuation. Many investors choose this approach over more formulaic approaches because it saves them more time since the latter method is a continual process. For a more intensive portfolio rebalancing approach, investors may want to try the percentage-of-portfolio rebalancing. This approach involves a rebalancing schedule that is focused on the allowable percentage composition of an asset in a portfolio. Each asset class is given a target weight with a corresponding tolerance range. Both of these portfolio rebalancing techniques, the corridor and the calendar method, are known as constant-mix strategies due to the weights of the holdings not changing. Identifying a range of corridors relies on the underlying characteristics of the individual asset classes. This is due to various securities possessing unique properties that influence the decision. When it comes to determining the range of corridors, the three most important variables are price volatility, correlation, and transaction costs. Higher transaction costs will likely require wider ranges to reduce the impact of pricey trading costs. Comparatively, high volatility has the opposite impact on the optimal corridor ranges. When volatile conditions are present, risky securities should be confined to a narrow range to protect them from being underrepresented in a portfolio. Lastly, any securities or asset classes that are strongly correlated with other investments can have a broader range since their price movements are equal to other assets within a portfolio. Another portfolio rebalancing approach is the constant-proportion portfolio insurance (CPPI) approach. This rebalancing strategy follows the approach that as an investor’s profits increase, as does their risk tolerance. The premise of this approach comes from investors having a preference of maintaining a minimum safety reserve held in risk-free or government bonds. More funds are invested in equities when the value of a portfolio increases, as a fall will result in a smaller position toward at-risk assets. Investors who use this approach must use portfolio rebalancing and optimization strategies as it does not provide specific details on the frequency of rebalancing. Plus, this approach only indicates how much equity should be held within a portfolio rather than holding asset classes along with their best corridors. Portfolio balancing is all about managing risk and not chasing after large returns. It provides protection and discipline for any investment management strategy. The ideal portfolio rebalancing strategy will balance out the overall needs with the explicit costs that are related to the chosen strategy. It’s important for investors to remember that portfolio rebalancing is not about completely overhauling a portfolio. An investors asset allocation plan shouldn’t have consistent strategy shifts unless they are in response to major life changes or changes in investing goals. The most important thing, however, is for investors giving their portfolios time to grow. Frequent strategy shift can negatively impact a portfolio. While the portfolio rebalancing strategies above are helpful for financial advisors, the best strategy is to use an investment portfolio management software. It will not only speed up the process of portfolio rebalancing but using financial planning software will help investors save time and will make it easier to review an entire overlook of their investments. AlphaDroid is one of the leading investment portfolio management tools for financial investors and advisors. Using asset allocation and algorithmic trading strategies, AlphaDroid helps investors analyze, construct, and compare investment portfolios. Want to learn more about AlphaDroid? Visit our site today!